I start my busy day with a cup of coffee. The caffeine helps wake me up and give me a boost of energy to take care of my kids. My children know that in the morning they can not bother Mom until she has her coffee. But thanks to Liporidex’s new formula Max15, I can cut back on my morning coffee and feel energized all day long. If you are hoping to achieve a decreased appetite, Liporidex features formulas that will provide the desired anorectic effect. Ingredients in their formulas, include caffeine, Bacopa, Higenamine, African Mango and more, which delay the onset of hunger and can even reduce the amount of food required to feel satisfied when taken prior to eating. After you eat, your brain releases serotonin and other neurotransmitters (brain cell chemical messengers) that regulate our level of satiety. When you have low serotonin levels, you are more likely to crave food. Without you realizing it, your body has learned that carbs are a great way to increase serotonin levels, explaining why you often crave high-carb foods. So instead of giving into your serotonin-seeking need for carbs, ingredients in Liporidex can quell the serotonin-motivated craving. They can additionally stimulate hormones involved in delaying gastric emptying, which make you feel full for longer after eating, thereby curbing unnecessary snacking after a meal. Other ingredients in Liporidex – including N-Acetyl-L-Carnintine and green tea – can stimulate an increase in metabolic rate, causing you to burn more calories and potentially lose weight. One mechanism by which this is accomplished is through the release of catecholamines – chemicals that function as messages between brain cells and tissues – such as adrenaline. Even a small increase in metabolic rate can cause the body to release energy as heat via thermogenesis, as opposed to storing it as fat. Another powerful ingredient – bacopa monnieri – actually speeds up metabolism through its actions on the thyroid by increasing T4 levels (thyroxine). This thyroid hormone is responsible for increasing basal metabolic rate and regulating lipid, protein, and carbohydrate metabolism. This unique ingredient therefore goes straight to the source to deliver its potent metabolic action. Related Should Toys be Banned from Happy Meals? This is my favorite part of the Liporidex formula. In addition to the influence on metabolism, the ingredients in Liporidex can raise your energy level to improve workout endurance. The directions say to take one or two capsules with a tall glass of water on an empty stomach 30 minutes before you eat or before a workout. I found it easier and more effective to take two capsules right before I workout or go for a run. The ingredients in the capsules have been shown to decrease fatigue, increase energy, and even improve reaction time by enhancing mental focus and concentration. This performance enrichment occurs secondary to suspended fatigue and the ability to preserve increased energy levels. These supplements additionally provide a safe, nootropic boost – enabling you to stimulate your mind and body. This cognitive-enhancing effect is delivered by our all-natural ingredients that exhibit neuroprotective properties including saponins from the herb bacopa monnieri – components that are scientifically proven to increase attention and alertness. These neurologically active ingredients will leave you feeling happy and healthy while boosting your memory and dimishing mental stress. This positive cognitive impact is ignited at the most molecular of neuroendocrinological levels via improvement in cerebral blood, anti-oxidative neuroprotection, acetylcholinesterase inhibition, beta-amyloid reduction, and neurotransmitter modulation. When I take Liporidex right before I work out I have more energy to get through my workout, and feel less fatigued throughout the rest of the day. I have cut back from 5 cups of coffee in the morning to only two. Receptors located on adipocytes (fat cells) are regulated by the surrounding hormonal and chemical milieu. Adipocytes and muscle cells alike contain adrenergic (adrenaline-responsive) receptors in the form of alpha and beta. Alpha adrenergic receptors make and store fat when they are activated, whereas the beta adrenergic receptors break down fat when they are activated. Ingredients in Liporidex , such as higenamine, function as a beta adrenergic receptor agonist, thereby activating the beta form of these receptors, while likely bypassing the alpha receptors. These same beta receptors are also activated by the sympathetic nervous system – the system famous for our “fight or flight” response to stressors. The SNS releases catecholamines epinephrine and norepinephrine (aka adrenaline) during exercise, which operate through a biochemical cascade that involves activation of the enzyme adenylate cyclase. This enzyme catalyzes the conversion of adenosine triphosphate into cyclic adenosine monophosphate, which functions as a second messenger, promoting the release of fat stores from adipocytes. These fats are released in the form of free fatty acids and glycerol. This released fat can then be burned for energy through thermogenesis via β3-adrenergic receptors. Related Mojo for the Holidays - CONTEST!! I haven’t noticed a change in my body fat percentage yet as a result of taking Liporidex. Although, I have only been taking it for a couple of weeks. It may take several weeks to see a major decrease in body fat. Most weight loss supplements on the market require that you take them three times a day, on an empty stomach, 30 minutes before a meal in order to see results. For busy moms like me, that is impossible to do. I love the convenience of only having to take two pills before I work out. It fits well into my schedule and I feel better and more energized after my workout. 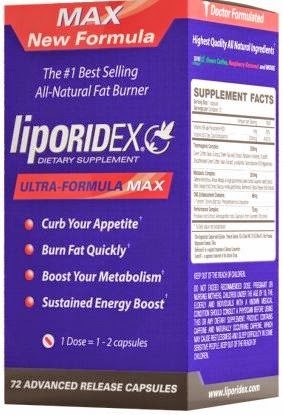 For more information about Liporidex fitness formulas and to purchase a formula for yourself visit myliporidex.com. *Disclosure: I received samples of Liporidex from Nuretix research labs in exchange for my honest review. All facts in this review were taken from myliporidex.com all opinions are accurate and 100% mine.